Here's the first public version and demonstration applying structure to curves in Rhino using the Rhino BullAnt plug-in. More to follow shortly. And here's the files to try yourself. Note that hollow sections won't be hollow if centreline isn't straight (for the moment), and element orientation will be incorporated soon. Here's a screen capture that presents two new tools (amongst others) in the Rhino Structural plug-ins. I've added commentary to this video (feel free to mute if it's too much to bear), but hopefully this might help in following what is happening. Download the screen capture from here if you can't access YouTube. 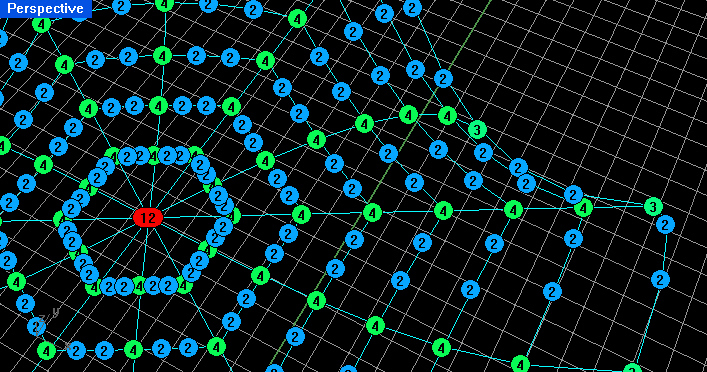 The first tool allows you to "contour connectivity", that is to graphically display how many elements connect to each node. This type of unexpected connectivity can often occur when importing and altering models from CAD environments, and a colorful visual check can make the process of verification much easier. Here's an image of the tool applied to the model from this blog post that you can also try for yourself. The second tool is in the Struct Draw Rhino plug-in, that enables an event watcher (disable it by right clicking the button). This works for any rhino model of points. If any point moves, the plug-in searches for a matching point in the other three quadrants (within tolerance), and adjusts it's position accordingly. This will work for any rhino command that modify's the point coordinate, and can save a lot of work in maintaining symmetry, particularly in structures such as stadia. There's plans to expand the tool so that you can specify any axis (and number of axis) for the mirror planes. Here's the files to try this for yourself.